Back in 2015, we wrote a blog post about some great craft beer stocking stuffers. And, while all of those items are still awesome, we have decided it's about time to post an updated list. So, without further ado, here is our list of 5 great stocking stuffers that you can purchase right here at The Glass Jug (or most any bottle shop that is worth a lick)! If you drink a lot of craft beer, you take pride in the tool you use to open your bottle. Thus, a really great bottle opener makes a fantastic gift for any beer enthusiast. At The Glass Jug, we partner with our good friend (and one of the OG Glass Jug bartenders) Aaron Shoemaker to craft the perfect bottle opener, made using the wood from our original bartop. These openers provide superior leverage, they don't bend the cap at all (so you can save them for crafts, if you'd like), and they have strategically-placed magnets to both catch the cap and allow you to stick your opener to your fridge for easy access. We all know that the common shaker pint glass is not a great vessel for consuming high-quality craft beer. Instead, any craft beer enthusiast will want to drink their beverages from a glass that is easy to hold, looks great, and is shaped in a way to bring out the beer's flavor and aroma. A couple great options are the "tulip" shaped glasses, which work well for Belgian styles, high-alcohol beers, and stouts, and the newer "craftmaster" style glass that is a perfect everyday drinking glass for your lagers, IPAs, brown ales, and the lower-alcohol session beers. We recently designed some new glassware that is for sale at The Glass Jug. It combines the advantages of the tulip glass and the typical craftmaster pint glass for what we think is the ultimate drinking experience. You can snag one of our glasses for $9, or take a look at our selection of other brewery glassware priced from $5-12. If you're a proud craft beer consumer, you want to wear your favorite brands. You've got to spread the gospel of good beer. So, if you have a craft beer enthusiast on your Christmas list, why not help them out by tossing some apparel from The Glass Jug Beer Lab (one of the newest breweries on the block) in their stocking? 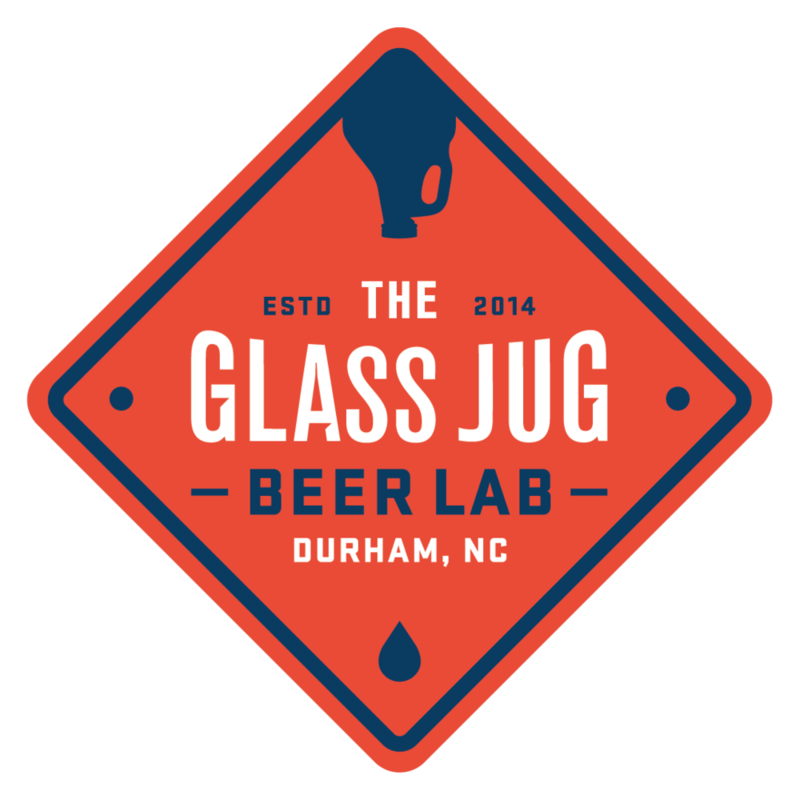 In addition to the hoodies, you can pick up t-shirts, tank tops, and hats from The Glass Jug Beer Lab. Did you know that there are now over 230 breweries open in North Carolina?! If you or your craft beer loving friend need a map to help plan your cross-state brewery tour, we have just the thing. The Great NC Beer Map details every craft brewery and major beer festival in North Carolina. It's your one-stop guide to everything you'll need to know before setting out on the road. Use the map for tracking down new breweries, finding a place to visit when you're in a new town, or putting together your own brewery tour. It's also a way to keep track of all the North Carolina breweries you've visited, by marking each symbol once you've been. The margins of the map include information on the art, science, and history of craft brewing, to give you a greater understanding of what's inside the glass. These elements serve as tools for decoding all the beer styles and stats listed on the brewery wall, and they also help you zero in on new brews that will appeal to your palette. It can be hard to pick out beer for someone else, so why not give them a gift card and let them do the shopping? Almost all craft beer bars and retail stores offer gift certificates that can be purchased and given as gifts. At The Glass Jug, we offer gift cards that can be purchased in any amount up to $100. We can hold the gift card for the recipient to pick up at their convenience, or for a small fee, we can mail it directly to you or the recipient.